Press release from Arkansas State University. 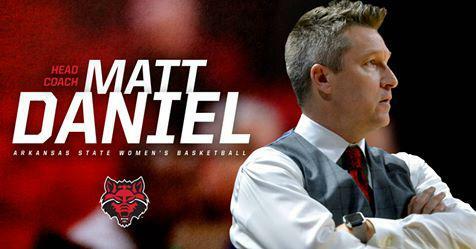 Arkansas State University has hired Jonesboro, Ark., native Matt Daniel as the head coach of the women’s basketball program. In his five seasons as head coach of the Thundering Herd, Daniel won 71 games and led the team to its first 20-plus win season in school history. He led the team to a pair of postseason appearances, including its first ever inclusion in the Women’s National Invitation Tournament (WNIT) in 2015-16. Daniel began his coaching career as a men’s graduate assistant at Arizona State in 1998-99 before becoming an assistant men’s coach at UT Arlington (1999-2003). He was the head boys’ basketball coach at Pulaski Academy in Little Rock for the 2003-04 season and led the Bruins to a 34-1 record and a national ranking. Daniel then went to Colorado as a women’s assistant coach for one year, serving as the team’s lead recruiter.